For far too many visitors to Europe, Belgium is essentially a fly-over or drive-through country. Given the fact that it borders France, Germany and the Netherlands, the smaller size of Belgium and big-name attractions elsewhere on the continent means tourists often skip this land for supposedly greener pastures. Those who do this, however, are missing out on true European culture and unique offerings in exchange for something larger, closer or more tourist-friendly. 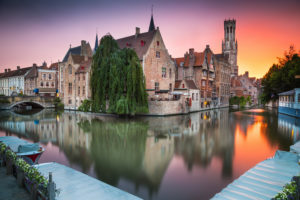 From the waffles to the waterways and war memorials, travel guide Andy Berke insists that there are plenty of landmarks worth seeing and delicacies worth trying in Belgium — a land of about 11 million as of 2016. Eat like a local: They’re not called “Belgian” waffles for nothing, you know. The breakfast staple was first introduced to America during the 1964-1965 World’s Fair in New York City. While it’s typically served plain or with a little whipped cream, the Americanized offerings are decidedly more decadent. While the title and homeland is up for debate among locals, “French” fries are believed to have first been prepared in Belgium’s Meuse Valley. The world wars: While some areas of Belgium escaped the great armed conflicts of the 20th Century relatively unscathed, other regions were witness to the most brutal fighting seen in either war. The areas near Flanders and Ypres remained in the crosshairs of both German and Allied powers during World War I. The impact of this fighting, and the casualties sustained, would inspire the “In Flanders Field” poem written in 1915 by Canadian physician and soldier John McCrae. Twenty nine years later, Allied and Axis forces would again do battle in Belgium, this time in the county’s Ardennes region. Travel guide Andy Berke says the area is now home to cemeteries and monuments marking the 1944 engagements in the waning months of World War II. “Venice of the North”: While this title is also open to debate, the city of Bruges is awash in waterways and canals for tourists to take to and relax on. The majority of boat tours will take passengers past the major landmarks of the city, which is home to only about 118,000 residents, says travel guide Andy Berke. The medieval architecture that stretches across the city includes the Church of Our Lady, which was first built in 1270 and features the second-highest brick tower, at 377 feet, in the world.